The Supervising Controller does not move all of the logic from the View to the Presenter, only the complex components, meaning there is some degree of code within the View component. The advantage here is that for simple changes there is no need to update the Presenter as it can be carried out directly within the View. This pattern is geared towards making simpler code over complete testability. There is also less code than other MVP patterns due to the use of data binding. The View for this pattern is therefore aware of the Model and is responsible for data binding the Model to the View. 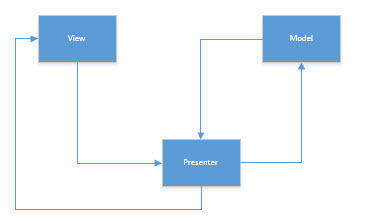 Here interaction with the Model is handled completely by the Presenter and the View itself is updated solely by the Presenter. This time, the View has limited communication with the Model, for basic data binding. The View is once again updated by the Presenter but this time is also updated from the Model via data binding. The rest of this post will go through the steps of creating a WebPart in SharePoint using the Supervising MVP pattern. This is going to be a very basic example but will be enough to demonstrate how a Supervising MVP WebPart should be implemented. Nothing too complex here, a simple class with two public properties – Title and Url. For this example, the data contract class would be populated via the presenter with list item information. The view references the Model class (ListItemDataContract) and uses it as part of a collection. There’s also a method defined here which will be used to initialise the data and will be called by the presenter class, which we’ll come to next. Here, the constructor takes our view interface as a parameter and defines a public method which will be called by the WebPart while loading. To keep things completely separate, the call to ListItemsHelper.GetListItemData is contained in another class and assembly as the presenter should also be kept relatively lightweight. The above method is set to return a couple of dummy data contract items and for the purpose of this demo is sufficient. Obviously, this should be coming from a list directly. The presenter’s LoadListItems is called after the required controls have been created and added to the WebPart. 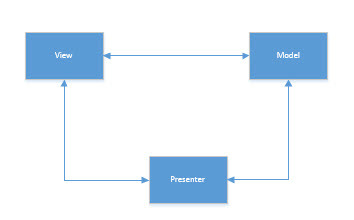 The view’s interface method LoadData is then called by the presenter after successfully loading the data for rendering. As stated, this is a very basic example but will hopefully be enough to show how to go about implementing Supervising MVP controls. Using this approach, with the Model, View, Presenter and Business Logic all in separate assemblies, it will be a lot easier to switch things around in the future. Also, writing unit tests will now be a lot easier and cover a larger code base than more traditional development methodologies. Download the solution for this example here.